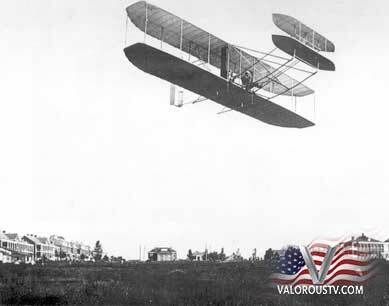 On September 17, 1908 Orville Wright took his 3rd passenger in the Military Flyer, Thomas E. Selfridge. Though the first two trials had been successful, the third was a catastrophe. The idea of an airplane as a military weapon was being considered long before World War I. It had only been five years since Orville and Wilbur Wright made their first flight at Kill Devil Hills, North Carolina, when Orville along with Charlie Taylor and Charlie Furnas went to Fort Myer, Virginia to demonstrate the brothers’ Flyer to the U.S Army. They were transporting the crated aircraft from Arlington Station to a large balloon hangar. The War Department was considering purchasing the Wrights’ aircraft for a new military airplane. To get this contract, Orville had to prove that the airplane could successfully carry passengers. The Wright brothers had made hundreds of these flights before, traveling across the United States and Europe in order to demonstrate their flying machine. In point of fact, he had done some work. Orville and the two Charlies worked with efficiency and focus that amazed many of the Army officials who observed them. And they needed to focus — things did not go well. The engine refused to run properly; it would not develop the hoped-for horsepower. This put the screws to Orville and his assistants. One of the requirements in the Army specifications was that the airplane fly 40 miles per hour. If it flew slower — even by just a small amount — the payment to the Wrights would be significantly less. That summer, Baldwin, and Curtiss had delivered a dirigible to the Army that flew 4/10 of a mile per hour slower than specified, and they were docked $6,750! Orville, Charlie, and Charlie nursed the sick engine back to health with higher octane gasoline and some new oil cups. On September 3, Orville made his first public flight. Like Wilbur’s, it was short and sweet — just a turn and a half of the Fort Myer parade grounds. The public was unimpressed — the news story was buried on page 3 of the Washington “Evening Star”. But they did not remain unimpressed for long. The flights began to get longer and longer, and by September 9, Orville was breaking records almost daily and remaining aloft for over an hour at a time. 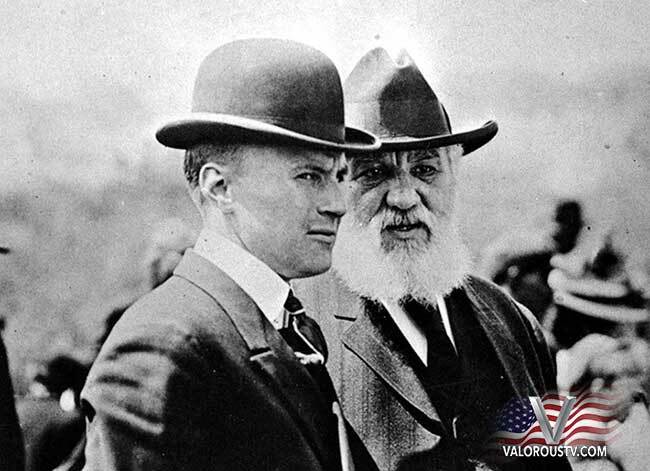 He also began taking passengers, flying the aviation experts that the Army had assembled to review the Wright airplane. He took the first official passenger, Lt. Frank P. Lahm, into the air on September 10, 1908. Two days later, Orville took another passenger, Major George O. Squier, up in the Flyer for a nine-minute loop around Fort Myer. Though the first two trials had been successful, the third was a catastrophe. The flight began normally and uneventfully as Orville made climbing circles around the grounds. Suddenly there were two loud thumps. Later, the Wrights and the Army would learn that a propeller had split. As Orville reached to cut off the engine, the airplane gave a violent shake as the broken propeller caught the aircraft rigging. The craft lunged for the ground, hitting nose-first and burying the pilot and passenger in a twisted mess of wood, wire, and cloth. When he was finally extricated, both men were taken to the fort’s hospital. Late in the evening, a doctor announced that Orville had suffered a broken leg, broken ribs, and an injured back. His condition was serious, but he would live — although Orville’s leg and back pained him for the rest of his days. Lt. Thomas Selfridge was less fortunate. He died on the operating table, the first victim of an accident in a powered aircraft. The news of Orville’s accident galvanized his sister Katharine. Without hesitation, she took an indefinite leave from her teaching job in Dayton and left for Fort Myer. Once there, Katharine oversaw Orville’s medical care and attended to his affairs while he was convalescing. Katharine asked Octave Chanute to help her look after her brothers’ fledgling airplane business. Members of the A.E.A. 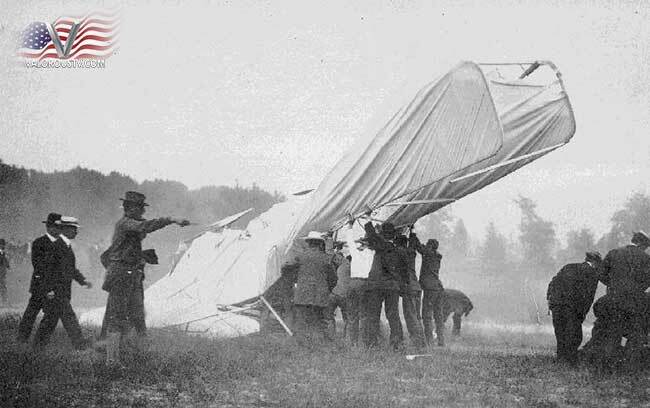 were in town for Lt. Selfridge’s funeral and they were curious for a peek at the wrecked Wright flying machine. They had, in fact, visited the balloon shed where the wreckage was kept and Alexander Graham Bell had measured the wing. When Orville was well enough, he had the two Charlies bring him bits of the wreckage to inspect. He quickly found the cause of the accident — one propeller had broken and clipped a bracing wire that held the tail in place. As the tail collapsed, it sent the Flyer into a deadly dive. Orville explained his conclusions to the Army, and the Army was quick to assure him they would extend his contract. Although he had not yet completed his demonstration flights, the Board of Ordinance was convinced the Flyer would do everything the Wrights had claimed. The crash was a setback for military aviation in the United States, but the rest of the world continued with their pursuit of military aviation. These developments were soon put to the test.